Sunday, June 10, 2012. 3:00 p.m. 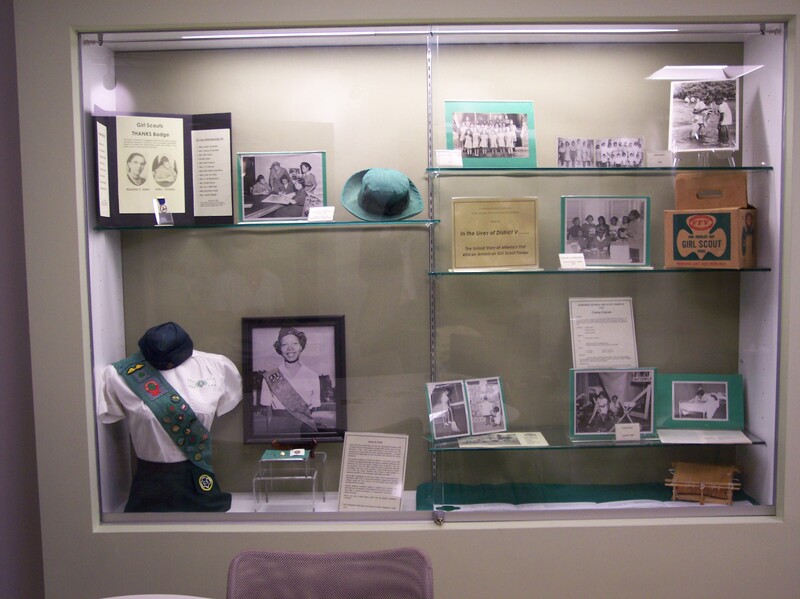 The Auburn Avenue Research Library will host Atlanta’s First Black Girl Scouts: The Untold Story of the District V Girl Scout Troops. This community discussion will highlight the experiences of Atlanta’s first African American Girl Scout troops, and honor the achievements of Bazoline Usher, Phyllis Dews, and Roslyn Pope. 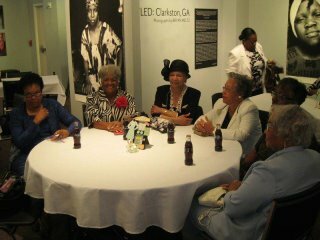 Usher led the group of African American women who founded Atlanta’s first troops for girls of color in 1943. Dews was the second Field Director of District V. Pope was the 1953 Senior Girl Scout All State Camper and had numerous accomplishments in her Girl Scout career. This event will also include displays of photographs, Girl Scout memorabilia, pins and vintage uniforms pieces from the 1940 – 50’s that reflect District V’s achievements in scouting. Girl Scout Troop 1368 in period uniforms. Picture courtesy of Rhonda Barrow. A Senior from Troop 1368 at Ebenezer Baptist Church in Atlanta will be in a uniform from that era and serve as moderator for the discussion. This picture was taken at their cookie booth sale on Girl Scout Sunday, March 11, 2012. The Auburn Avenue Research Library on African American Culture and History is located at 101 Auburn Avenue, NE, Atlanta, GA 30303; Tel: 404-730-4001. All events are free and open to the public. We hope to see you there! Josephine Holloway with her granddaughter, 1960s. Courtesy of Girl Scouts of Middle Tennessee. In May 1952 in middle Tennessee, there lived a Girl Scout captain following the same dream as our founder Juliette Low–Girl Scouts of the USA for every American girl. 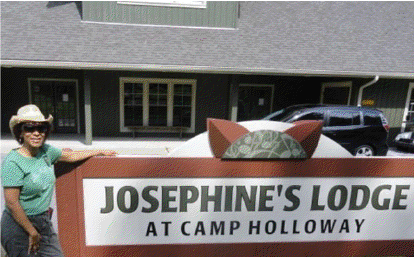 Girl Scout Captain Josephine Holloway, a former Social Worker, purchased 50 acres of land with the help of her husband, Dr. Guerney Holloway, for a Girl Scout campgrounds dedicated for African American girls. The camp was a first for Girl Scouts in the South. Before the civil rights movement, local laws and customs prevented Mrs. Holloway’s Troop 200 from camping overnight with other troops during camping events. To give her troop a true camping experience, Mrs. Holloway searched for land with running water, such as a stream, for her scouts to bathe and cook. She found a land lot in Millersville, Tennessee, which even had a farmhouse that the troop would later use as their lodge. The field had been unattended and the farmhouse dilapidated, but Mrs. Holloway was a visionary. She encouraged her scouts and their parents to envision the cabins, trails, and the pool. Every weekend they visited the grounds, tackled the overgrowth, and followed the instructions of Mrs. Holloway’s designs for the camp. Since its dedication 60 years ago, the Girl Scouts of Middle Tennessee have purchased additional lots to increase the campground’s size to the current 76 acres. They later honored Mrs. Holloway with the camp’s name change to Camp Holloway. Many people in Tennessee see Mrs. Holloway as a hidden heroine. Her efforts to help Ms. Low’s dream for every American girl to have the opportunity to become a Girl Scout are heroic due to social challenges before and during civil rights movement. I had to visit the campgrounds myself. Camp Holloway has been completely renovated. Girls can experience archery, running through an obstacle course, rappelling off of a tower, rock climbing, swimming, team adventuring, and tree climbing. I can only imagine Mrs. Holloway would be so proud with the updates. There is even a patch that visiting Girl Scout campers can earn, called the “Josephine Holloway/Guerney’s Cabin Patch.” To visit Camp Holloway, call 615-383-0490 or visit the website at http://gsmidtn.org/camp/category/camp-holloway/. Blog post written by TaMara Powell, Girl Scouts of Greater Atlanta Archives Volunteer and Girl Scout Troop Leader. 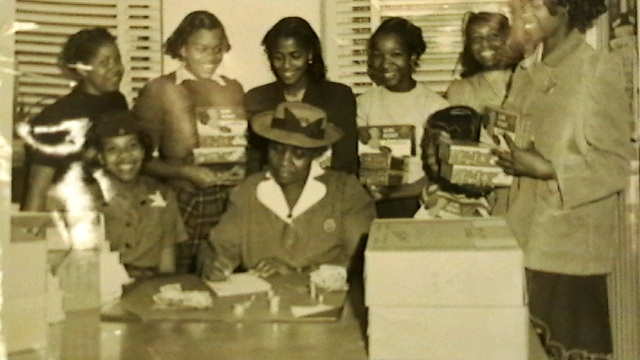 The Greater Atlanta Chapter History/Archives committee features the stories from the first Atlanta African-American Girl Scout troops that began in 1943. 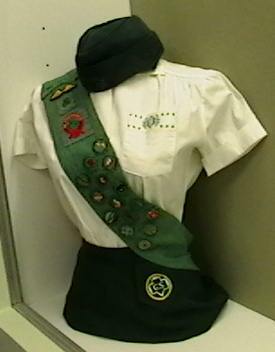 The showcase displays 25 items including photographs of Girl Scout memorabilia. Pins and vintage uniforms pieces from the 1940 – 50’s reflect District V’s achievements in scouting. Part of the area covered by District V included the Auburn district of downtown Atlanta. There are more than ten black and white photographs in the exhibit. Some are from The Atlanta Daily World newspaper and one is from a Jet Magazine photo shoot that featured 1953 Senior Girl Scout All State Camper, Roslyn Pope. Replicas of Miss Pope’s uniform with badges are also included. 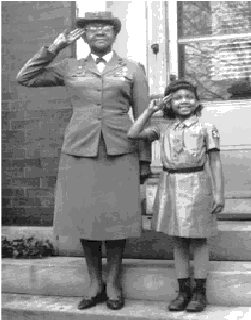 Miss Bazoline Usher in 1943 headed 25 to 30 African-American women to start troops for girls of color, which became District V. Miss Usher worked many years with the Girl Scouts. 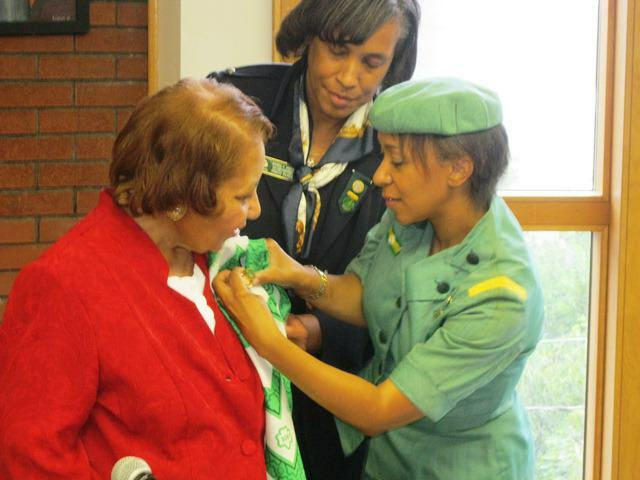 She received Girl Scouts’ highest honor, the “Thank You” pin, in the mid 1940’s. The pin, also known as the Thanks Badge, is displayed along with Miss Usher’s photograph. There is a list of other honorees awarded this pin for their exceptional service that benefited the entire Girl Scout council. It is a gold filled and enamel medallion on a blue grosgrain ribbon. 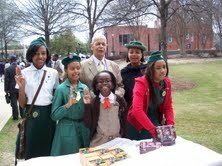 District V in their first year as Girl Scouts placed second in cookie sales in Atlanta. 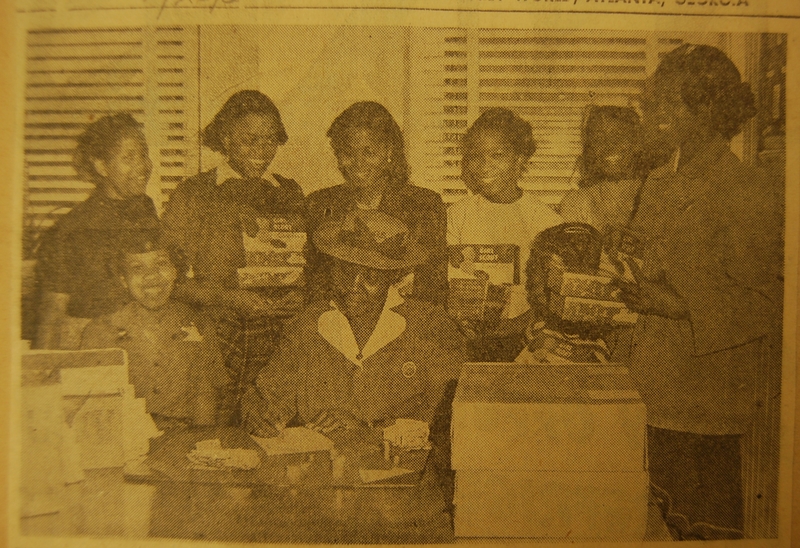 A photograph from the The Atlanta Daily World depicts scouts and Troop Leader with cookie boxes and counting their profits. Girl Scouts from District V were able to experience camp life at Camp J.K. Orr in Lovejoy, Georgia, which was rented from the Boy Scouts of America. A brochure called Camping for me (1963) promotes District V’s first official campsite in Carver Park. The George Washington Carver State Park is the first Georgia state park for African-Americans. Carver Park neighbors Girl Scout Camp Pine Acres on Lake Allatoona near Acworth. 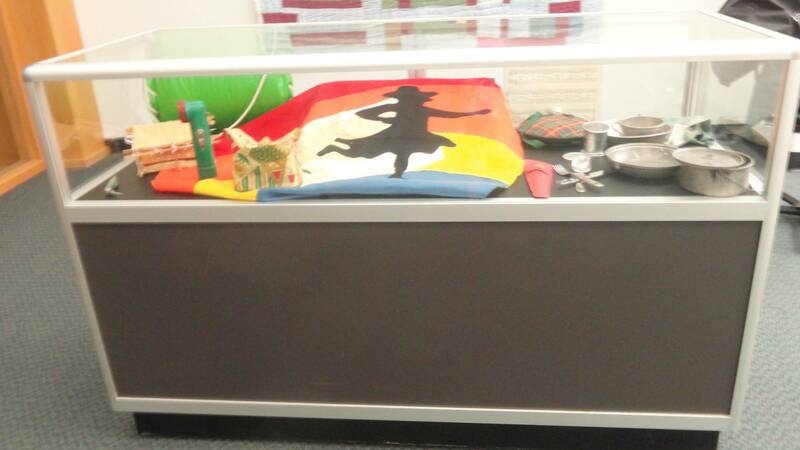 Some other artifacts include a sample size tent as well as a cookie case from the 1960s. A timeline which highlights the many historical events in Girl Scouts District V concludes the exhibit. Special thanks to Rhonda Barrow, Sue Belden, Denise McGill, Margaret Paschal and TaMara Powell for creating this educational and interesting exhibit.